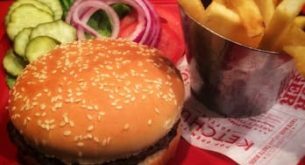 There has been a lot of disappointing chatter lately as dairy-allergic fans of Red Robin suddenly noticed that the allergy-friendly chain’s burger buns were showing up on the restaurant’s interactive allergen guide as unsafe for those with dairy allergies – a sudden and dramatic change from past practices. We contacted top management at Red Robin and were told this was a temporary change and that the buns would likely be deemed safe again as of Monday. Here’s a transcript from the company directly. “The buns do not contain dairy/milk, however we are in the process of changing our cooking procedures/equipment for our buns and with this change our buns will no longer be toasted with an oil – they will be dry toasted. Our current process is to “butter” our buns with a cottonseed oil (no [major] allergens) and the current bun cooking equipment does require an oil for toasting the buns. In some markets, due to the transition of equipment, some areas have run low or out of stock on the cottonseed oil so we have approved the use of another butter oil used in our restaurants to make our buzz sauce. This oil does contain butter. This change is only a temporary change until all restaurants are fully transitioned to the new bun toaster. To protect our Guest, we have added milk/dairy as an allergen to all of our buns (except for the gluten free bun) during this transition period. Red Robin immediately followed up with this. I just received an update from our supply chain team and the installation of the new bun toasters in all restaurant will be complete by the end of the week [this weekend]. To provide a bit of a buffer, I will have the milk allergen removed from buns next Monday. I have to admit that I wish management had given the community (or even just us, to pass on to you) advanced notice of this issue so as not to disappoint any diners. Regardless, I appreciate – once again – management’s concern for the food allergy community and their willingness and desire to take as much extra precaution as possible on our behalf. So dairy-allergic diners (including my son, if you’re reading), fret not. It’s almost time to enjoy those juicy burgers again! Thank you, allergy eats for betting an answer! My daughter is allergic to sesame seeds. She told me that last time she went to RR they no longer offered the ciabatta roll for her burger (which she could eat) and instead only had rolls with sesame seeds. The only other option was a gluten-free roll for a surcharge (which they neglected to inform her about). RR used to be one of her favorites. Now she won’t go there anymore. RR has been in a rapid decline the last few years in terms of overall quality of service and their food. my last few visits confirmed that they have gotten seriously careless with food handling procedures. they had a reputation for being very conscientious of guests food allergy issues but i would not trust my childrens lives with them now. i wonder what happened that started this trend? I live in Roanoke Va, and I have to have gluten free. I am so scared to eat at our Red Robin too many times they served my Hamburg on reg bun. I love a good hamburger & fries but I can’t trust them. Red Robin is my “go-to” restaurant. I love how they really try to work with those with food allergies. This just tops the cake! It’s never been clear to me whether the buns are made in a facility that processes tree nuts or peanuts. My daughter has a nut allergy and normally orders the burger without the bun to be safe. Is there any way to get this info? She would prefer to have the bun if we knew it was safe. Earlier this summer I didn’t finish my burger for the first time. I always crush my whiskey burger, never putting it down after I pick it up. The bun tasted stale and just threw off the whole burger, I thought. Tonight I just got back from RR again and I had to ask about the bun because again it tasted stale and was cold. I was told there was no difference and they brought me a new bun but I didn’t even try to switch it out. That bun was also cold and didn’t look good. I tell everyone I never have had a bad burger there (before this summer) and figured that one out of hundreds was not a bad thing but after tonight and now reading this I realize it is different. Crushing that I just lost one of my favorite burger places and overall resteraunts.